Relax, rejuvenate, stretch and strengthen your body and mind with a unique blend of yoga, great food and interesting company with the backdrop of French wine country. For up to date info on our Retreat & Group holiday schedule, please visit our deicated Events page HERE. Maison Broche et Clos Neuf is happy to welcome you on our new yoga holidays in gorgeous Cornillon, Languedoc-Rousiliion. The Yoga holidays are suitable for those ranging from beginner to intermediate level. 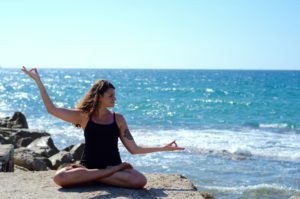 Here, the specific health benefits of yoga are perfectly combined with healthy Mediterranean food. Included in the price are all food, spacious accommodation and any other activities you wish to join (hikes, bike trips, morning walks and meditation). At the heart of the yoga holiday is exceptional instruction by international instructors. The teachers have a heartfelt and down-to-earth approach to wellbeing. The diverse schedule will offer 2 classes per day, each and hour and half length. An in-depth asana/vinyasa/ashtanga pratice will be accompanied by lessons in a variety of meditation technqiues throughout the week. The schedule is structured to allow free-time during the day so guests may enjoy their holiday’s relaxing by the pool, adventuring through the region or however else they choose. 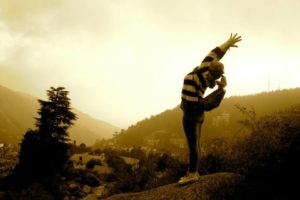 I am a 500hr RYT with appleyoga (London, UK) and Association for Yoga and Meditation (Rishikesh, India). Yoga became a significant part of my life when I began my training as an actor in 2003. It started out as a thorough preparation for a performance or audition, and helped me find and sustain my presence while acting. I lived in London, UK for 6 years where I taught classes and led retreats in Morocco and the beautiful English countryside. I am now back in Montreal and connecting with the yoga community here. It’s alive and well! For me, yoga means different things on different days. One day it’s a means to move my body and get rid of any stiffness or to disperse stagnant energy throughout my body. On other days yoga is a way for me to find a deeper connection with myself and the environment around me. It can be as spiritual or as purely physical as I need it to be. However, I think overall yoga is truth for me. Whatever I need at any given time, yoga will give me providing I take the time to listen and enquire deep within. Whether I like it or not, my body, with all it’s intricate layers and functionings, never lies and yoga uncovers the truth of the situation, of the moment. Yoga teaches me to respond to the moment. How can I serve myself and others better in this moment? By asking and listening, yoga will give me the answer. Yoga means curiosity, questioning, listening, empowerment, self-esteem, clarity, focus, and truth. I wish to share the value and joy yoga brings to my life. BSc ATT, ARTC: I attained my Athletic therapy degree as well as passing his certification exam in 2011 and is a practising Athletic Rehabilitation Therapist Certified (ARTC) for the past 5 years. I work with a variety athletes in terms rehabilitating injuries and optimising performance for sport. In March 2015, I completed his Stott pilates instructor training and successfully passed his exams in May 2016 and I’m now a certified level 1 and 2 mat instructor. I’ve also keen interest in pilates, yoga, functional movement and mobility likes to combine all of these disciplines to make unique movement classes that activates, strengthens, mobilises and co-ordinate the body and ultimately aims at restoring muscular balance. 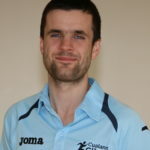 These classes combine a mixture of pilates, yoga postures and functional movement patterns which draws on his athletic therapy background – working with a variety of patients from the general public and athletes from many sporting backgrounds. The classes are tailored to the individuals movement needs and are based upon the persons own anatomy and movement ability. I have has also implemented many group/circuit and sports specifics training regimes for teams in a pre-season / strength and conditioning setting. Drawing on the principles of high intensity interval training, progressive overload, hybrid training and group games, these methods are integrated into a format that is designed to both work participants while keeping an emphasis on being a fun and varied workout. I hold a level 1 and 2 qualification in fascial manipulation and am one of a handful of therapists in the country who has this qualification, as well as qualifications in foot orthotics prescription, emergency first aid, kinesio tape application and soft tissue management. I have a keen interest in reading the most up to date literature and attend multiple sports medicine conferences on a variety of topics to keep up-to date within the industry. My journey with yoga has taken me to beautiful and surprising places. Yoga has become a vital part of my physical and mental being. Guiding others is a humbling and rewarding part of my practice. I am honored to now be a part of others spiritual journeys. Namaste. In love we are one. When I started this never ending yog journey I never thought I would have been part of somebody else’s yog path and yet here I am! I have profound respect and dedication towards this beautiful ancient and magical discipline that led me to sacred places and transformed my view of the life and the world. We’re spiritual beings, let’s start from here, everything else will unfold. Deep in the heart we are one. I am you, you are me. 11.00-16.00 Afternoon walk, hike, cycle or day trip.